Spinal fractures can occur from traumatic incidents like a car accident or a fall or from medical conditions that cause bone loss such as osteoporosis or cancer. The primary symptoms are back pain that won’t go away, a change in height, or a change in your natural posture. The best way to diagnose a spinal fracture is with an X-ray, so consult a physician to determine the cause of your back pain so that you can begin spinal fracture treatment as soon as possible. This is the most common type of spinal compression fracture. When a wedge fracture occurs, part of the vertebra, typically on the front side of the body, collapses, while the other side stays intact. The result is a wedge shape that can affect a person’s posture, often leading to a hunchback shape. When the entire vertebra collapses, the result is a crush fracture. Because the entire bone is affected more uniformly, this type of fracture might cause a reduction in height rather than a more dramatic posture change. As you might expect from the name, this type of fracture is characterized by a burst shape as the bone breaks in multiple directions. Pressure can cause bone fragments to push out from the spinal column, potentially impacting the spinal cord. Both wedge fractures and crush fractures tend to be mechanically stable. This means that after the fracture has occurred, the bone is not likely to continue to change or create any additional damage. On the other hand, a burst fracture is often unstable and should be addressed immediately with medical attention. Because the shattered bone fragments might continue to move around, there is potential risk of further damage to the surrounding nerves and tissues. Spinal fracture treatments vary depending on the type of injury, the associated symptoms, and how much damage the fracture has caused. In some cases, recovery can be as simple as getting ample rest, taking pain medication, and applying cold therapy to help reduce pain and swelling. 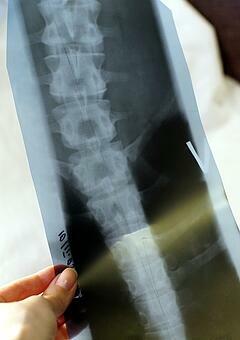 A back surgery like balloon kyphoplasty might be required for more serious injuries. The recovery time also depends on the injury, but a spinal fracture that heals on its own often takes about three months to repair completely. The significant pain typically subsides after a few days, but if you continue to apply cold and compression therapy throughout the recovery process, you can help accelerate healing and minimize your pain. Physical therapy is often recommended while recovering from a spinal fracture, especially if the injury has impacted your ability to walk properly or has affected your posture. A physical therapist can help you improve your posture and provide weight-bearing exercises to help promote bone healing.